Several graduates have taken the challenge of bringing the Denfeld hockey tradition to life at the Duluth Heritage Sports Center. Our goal is to raise funds to purchase an "Arch on the Wall," a place where we will display the rich legacy and history of Hunter Hockey. The funds we raise will not only commemorate our history, but fund the Heritage Center as well. To get the project started, we need to raise $20,000. Our next goal is to match or exceed that amount. Knowing the character of kids who wore maroon and gold, we are more than confident of our ability to do this. Denfeld and Central’s efforts to remember their legacy will most likely be followed by East, Morgan Park and Cathedral. We will not only be remembering our past, we will be building a future by supporting this terrific venue for children. Youth, boys and girls, will learn and grow through the values of high school sports. Let us give back in order to create a new generation of citizens to meet the challenges that face our communities and our nation. This is an unselfish act. 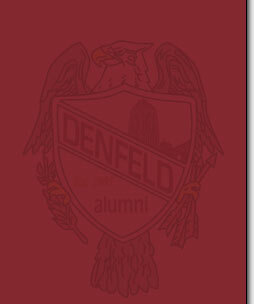 We hope you will consider making a contribution, large or small, to the Denfeld Hockey Wall. In so doing, you will honor your teammates, coaches, parents and your community by memorializing Hunter Hockey for past, present, and future generations. Whether you were a star winger or a rink rat from Irving, Piedmont, Merritt, Norton Park or Wheeler, your contribution will be greatly appreciated. Denfeld Hockey belongs in that hall. In the words of a good friend, "because it is my town, my school, my team." This great game of hockey, especially Denfeld Hockey, has helped to shape all of us in some way. It's time that we each give back. Please join us. Your contribution is tax deductible and all funding will be handled directly by the Heritage Center. If you have any photos or headlines you would like us to consider, please forward them to the Duluth Heritage Sports Center, 120 S.30th Ave. W., Duluth MN 55806, Attention: Denfeld Hockey Wall. We cannot guarantee what the final product will be, but we will send your photo or headline back to you after it is scanned for possible use. For questions please call Mark Helmer 218-525-2188 or Rick Francisco 218-721-5913. To learn more about the Heritage Center, please go to duluthheritagesportscenter.com. It's late in the third period for many of us -- don't leave your teammates with anything but your best!